The Master of Darkness investigates bizarre crimes in classic pulp novels by Walter Gibson and Theodore Tinsley writing as "Maxwell Grant." 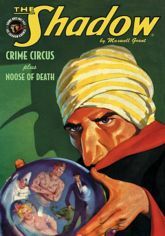 First, The Shadow goes undercover behind the glamour and gaiety of the Big Top to unmask Circus Crime. Then, an off-trail mystery leads The Shadow from Manhattan's Madison Square Garden to a Western dude ranch to save innocent victims from the strangling coils of the Noose of Death. This instant collector's item features the original color pulp covers by George Rozen and Graves Gladney, the classic interior illustrations by legendary illustrator Tom Lovell and commentary by popular culture historian Will Murray.